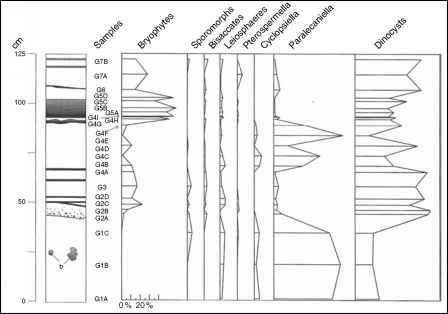 Figure 7.17 The K-T boundary interval at the West Bijou Site showing sample positions for palynology and iridium analyses, fern-spore spike as percentages of fern spores in samples, and relative abundance of shocked quartz in samples (X marks) (from Barclay et al. 2003). Reprinted by permission. Figure 7.18 Lower Paleocene leaves from the distal part of the Denver Basin. a - Cornophyllum newberryi (DMNH 23481), b - Paranymphaea crassifolia (DMNH 23515), c - Cissites panduratus (DMNH 26144), d - Browniea serrata (DMNH 23502), e - "Populus" nebrascensis (DMNH 23503). Scale bar is 1 cm. 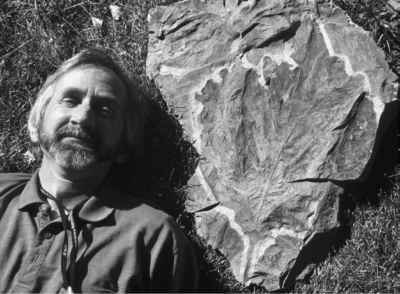 Figure 7.19 Large fossil leaf (Platanites marginata) from the Castle Rock rainforest with Steve Wallace for scale. Steve is the vertebrate paleontologist from the Colorado Department of Transportation who originally found the Castle Rock locality. preconceptions of the basal Paleocene FUI megaflora, knowledge of subtropical rainforest-like floras from the lower Eocene of Wyoming, and foraminiferal evidence for extreme global warming between 55 and 52 Ma, the site was misinterpreted as early Eocene in age. Subsequent excavations revealed that the site was even more diverse and displayed spatial heterogeneity similar to extant high-diversity forests (Johnson and Ellis 2002; Ellis et al. 2003). Palynological analysis yielded a result of paly-nostratigraphic Zone P3, or lower Paleocene (Nichols and Fleming 2002). The Kiowa Core was, in part, drilled to date this enigmatic site, and results from Kiowa and the nearby Castle Pines Core in concert with additional palynology, magnetostratigraphy, radiometric dating, and basin analysis eventually led to an age determination of 63.8 ± 0.3 Ma for the site (Ellis et al. 2003). Several additional "rainforest" sites were discovered in proximity to the Front Range between 1994 and 2003 (Johnson et al. 2003) and it became clear that the early Paleocene megafloras of the western margin of the Denver Basin were considerably different from the FUI megafloras from West Bijou Creek and other localities in the central and eastern basin (compare Figure 7.21 and Figure 7.22). A preliminary basin-wide synthesis of 130 megafloral localities (Johnson et al. 2003) confirmed this pattern and argued for environmental, elevational, and/or orographic control for this pattern. 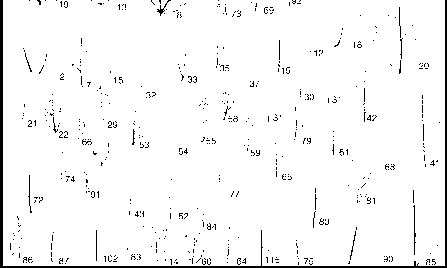 Figure 7.20 Line drawings to scale of the initial 98 Castle Rock leaf morphotypes from the lower Paleocene (from Johnson and Ellis 2002). The numbers next to each leaf indicate the morphotype number. Dotted lines indicate areas that are missing on the primary reference specimens but are available on other examples of the same morphotype. The upper left area contains the toothed dicot species. The upper right contains all the non-dicots (ferns, cycads, and conifers). The lower group contains the smooth-margined dicot species. Reprinted by permission. Today, rainforests grow in areas of warm temperature, low seasonality, and high rainfall. Many extant rainforests grow on slopes of mountain ranges where orographic effects cause locally high rainfall. The proximity of the Castle Rock rainforest and associated localities to the Rocky Mountain Front Range indicates that the early Paleocene rainforests of the Denver Basin may have existed because of orographically intensified rainfall. Regional-scale climate modeling of the Rocky Mountain Front Range in the Paleogene supports this scenario (Sewall and Sloan 2006). 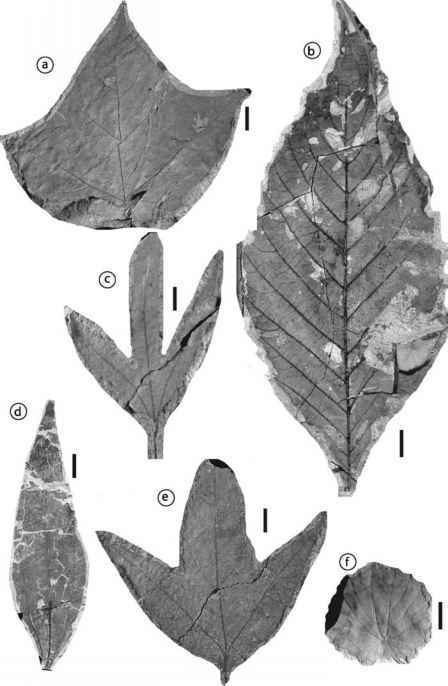 Figure 7.21 Paleocene leaves from Castle Rock, Colorado, proximal to the Rocky Mountain Front. 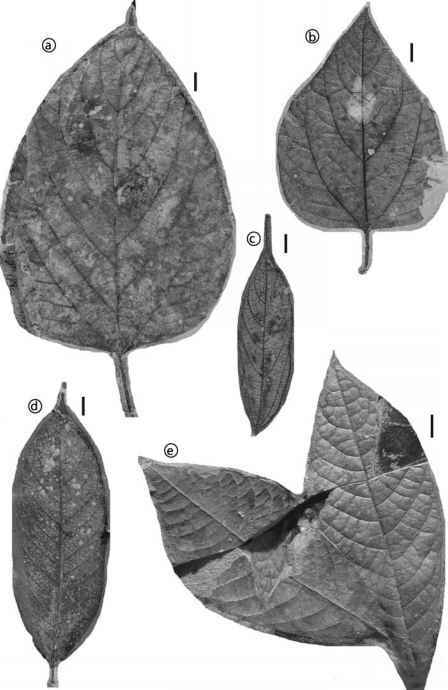 a - Tiliaceae (DMNH 23246), b - Morphotype DB211 (DMNH 26021), c - Morphotype DB006 (DMNH 8698), d - Morphotype DB005 (DMNH 19180), e - Morphotype DB200 (DMNH 25513). Scale bar is 1 cm. 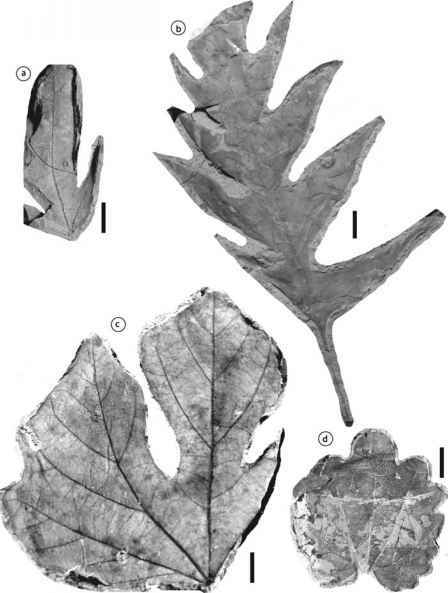 Figure 7.22 Paleocene leaves from the part of the Denver Basin proximal to the Rocky Mountain Front that are not from the Castle Rock locality. 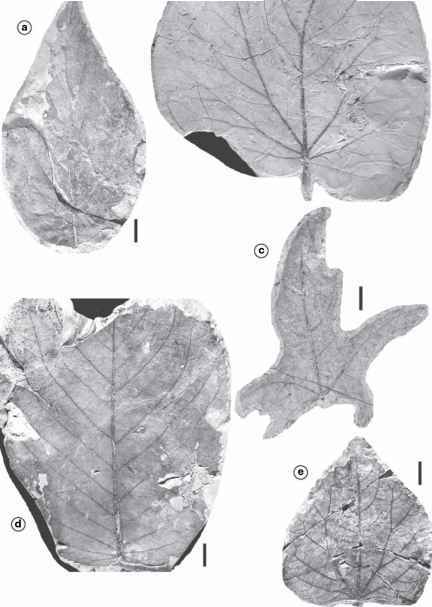 a - Morphotype DB909 (SMNH 102.152), b - Rhamnusgoldiana DB018 (SMNH102.29), c - (DMNH 27553), d - Platanus sp. (DMNH 27554), e - Morphotype DB917 (SMNH 102.560). Scale bar is 1 cm. Implications for the K-T boundary are less clear. If local topography and orography can have such a huge effect on the composition and diversity of early Paleocene floras, then how applicable are previous understandings of K-T boundary floral recovery based on floras collected in the middle parts of the basins? Work on Denver Basin megafloras is ongoing but several points are evident: (1) Cretaceous megafloras from the Denver Basin, although poorly sampled, are similar to typical Upper Cretaceous floras from the northern Great Plains and show little variation based on proximity to the mountains (compare Figure 7.23 and Figure 7.24); (2) the Castle Rock rainforest, although diverse, does not contain a large number of species known from Cretaceous localities; (3) the Castle Rock flora has extremely low levels of insect damage suggesting that, despite its floral diversity, the food web is still recovering from the K-T extinction (Wilf et al. 2006). 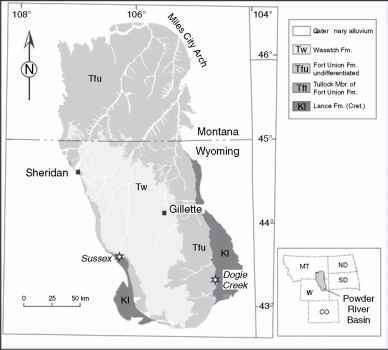 In the Powder River Basin of eastern Wyoming (Figure 7.25), the uppermost Cretaceous unit is the Lance Formation, dinosaur-bearing strata that are equivalent to the Hell Creek Formation of the Dakotas and Montana. The Lance Formation is overlain by the coal-bearing Fort Union Formation and is composed of fluvial sandstone, mudstone, and claystone. Lignite beds are rare and thin in the Lance Formation. The Fort Union Formation in Wyoming is composed of carbonaceous shale, variegated mudstone, crevasse-splay sandstone, and numerous coal beds. Some of these coal beds are of extraordinary thickness (30 m or more), especially toward the top of the formation. The strong change in the lithology of the formations at or near the K-T boundary has long been a useful criterion for approximating the position of the boundary in the field where it is assumed to be at the formation contact (Brown 1962). Three iridium-bearing K-T boundary localities are known in the Power River Basin. Two are located on the west, and one in the southeast. Figure 7.23 Maastrichtian leaves from the Laramie Formation and the D1 sequence in the part of the Denver Basin proximal to the Rocky Mountain Front. a - (DMNH 27557), b - Morphotype JC054 (DMNH 23731), c - (DMNH 27555), d - Marmarthiapearsonii (DMNH 2125), e - (DMNH 27556), f - Morphotype DB 802 (DMNH 23133). Scale bar is 1 cm. Figure 7.24 Maastrichtian leaves from the Laramie Formation and the D1 sequence from the distal part of the Denver Basin. 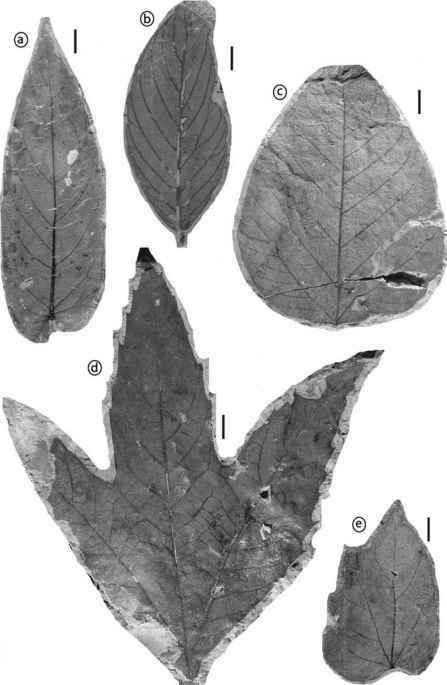 a - Morphotype LA036 (DMNH 23150), b -'Artocarpus'' sp. (DMNH27558), c - (DMNH27560), d- Marmathiajohnsonii (DMNH 27559). Scalebaris1cm. palynostratigraphy. Leffingwell's study was published ten years before the extraterrestrial impact theory was proposed and he postulated that the palyno-floral change was due to a depositional hiatus within the 1-m boundary interval, even though there was no field evidence for a hiatus. Figure 7.25 Geologic map of the Powder River Basin showing approximate positions of K-T boundary localities discussed in the text, Sussex (locality 63 in Table 2.1 and Appendix), Dogie Creek (locality 61), and Teapot Dome (locality 62) near Sussex. 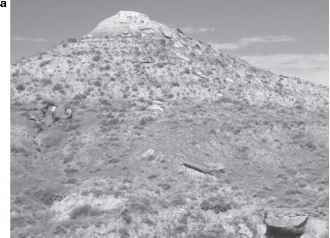 Figure 7.26 Photographs of the Dogie Creek locality at a distance and close up. a - Geologists are excavating the K-T boundary interval. b - The boundary claystone is difficult to distinguish from surrounding mudstone; it lies at the level of the tip of the hammer point and the bottom of the scale, several centimeters beneath a thin coal bed. goyazite (Bohor et al. 1987a). The goyazite was a replacement mineral; spherules replaced by other minerals were known in marine K-T boundary localities, and some that had been altered to kaolinite had been described at the Brownie Butte, Montana, locality (Bohor et al. 1984).